Verdant Catacombs ($68.99) Price History from major stores - Modern Masters 2017 - MTGPrice.com Values for Ebay, Amazon and hobby stores! 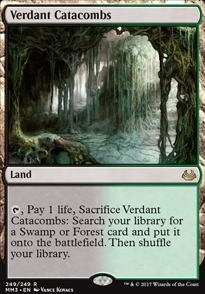 Card Text: %T, Pay 1 life, Sacrifice Verdant Catacombs: Search your library for a Swamp or Forest card and put it onto the battlefield. Then shuffle your library.